In his first press conference at the Miami Open, Rafa Nadal left an interesting headline when asked about what he would say to all those kids around the world dreaming of being like him. control your expectations (those that you set and those that others set for you). Don’t set goals too high, because they might lead you to frustration. Rafa, one of the few players that truly thinks any opponent can beat him, but that he can also beat any rival (something many players say but few deeply believe), is the best example of how we should always try to find our own balance in order to grow: stand up when we feel we are going under (or when someone tries to make us think that we are) and to keep our feet on the ground when we think we’re touching the sky (or when others make us think so –a difficult task that basketball rising star Luka Doncic is doing perfectly thanks to his incredible maturity and to being so well surrounded). 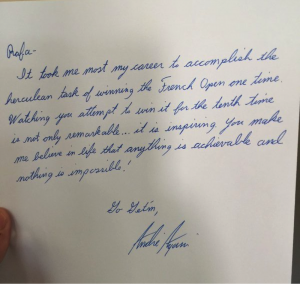 I agree with Rafa’s opinion 100%, yet I believe that it is indeed important to have a role model (and a mentor if we can), and that we should aspire to be like Rafa, or like all those people we consider worth learning from. When psychologists Penelope Lockwood and Ziva Kunda requested college students to list what they hoped to achieve over the following decade, the students came with perfectly ordinary objectives. Another group of students was instructed to read a newspaper article about an outstanding peer and then list their goals; they aimed much higher. Having a role model elevated their aspirations. Parents and relatives (in the case of Toni Nadal) play a major role in helping youth manage expectations and search for role models. But what can we do as parents or coaches in order to help our children/players find those role models in sports or in any other discipline? Are we as parents willing and ready to let our children think different than us? Sometimes it is hard to picture our children rooting for a different sports team or voting for the opposing political party. Some even go further and consider it a betrayal… Is our children’s aspiration to meet our expectations or to establish their own? If we as parents or coaches want to encourage our children to be unique, to broaden their horizons and become the best version they can be, we must be brave and help them find their own role models in diverse fields so it can be more enriching for them. – And what if we (or they) don’t find this mentor or mentors? Finding the right mentor is not always easy, but we can find inspiration in the small actions, such as through books, reading the biographies of great originals through history (as Adam Grant suggests in his book Originals), reading Rafa Nadal’s brilliant biography, or simply by sitting together to watch Rafa give everything he has in every point. I want to join Andre Agassi and so many others in having Rafa as our role model and let me insist: let’s not be like Rafa Nadal, let’s be Rafa Nadal. Let’s be this person that gives his or her best in every little thing that we do. Doing this, who knows if one day we will outpace our role models, like Rafa did with his childhood hero Carlos Moya. Isn’t that what evolution is about?